A spin through the latest movies on the road of pop culture! Space, science tell us, just continues to expand—endlessly, forever. How else would it have room for Star Wars, the multi-billion-dollar franchise that just gets bigger all the time? It’s listed by Guinness World Records as the planet’s most successful movie merchandising series, a gargantuan, ever-growing realm of films, TV shows, games, comic books, toys and other products. It all started back in 1977, sort of. As fans know, the first movie was really the fourth—or Episode IV—in the middle of a much bigger story arc to come, one that would play out over the following four decades. And now, the rollicking eighth film takes us back some 30 years, prequel-style, before the big bang. 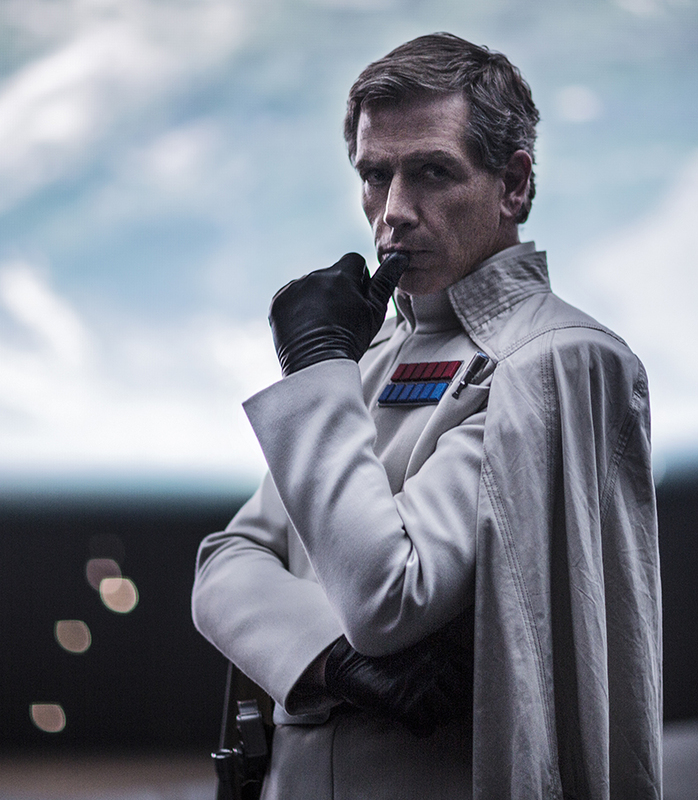 In the new Rogue One: A Star Wars Story, Felicity Jones is a feisty fireball as Jyn Erso, the daughter of a brilliant scientist (Mads Milkkelsen) kidnapped by a fascist operations director (Ben Mendelsohn) of the Galactic Empire to complete his ultimate weapon of mass destruction, the Death Star. 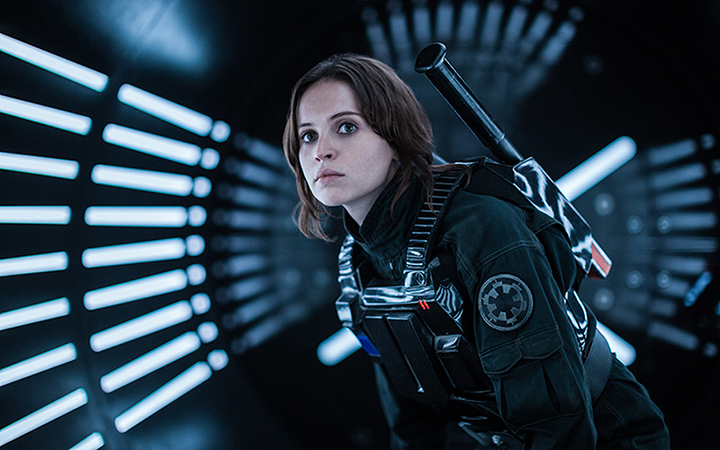 When Jyn finds out her father has built a secret booby trap, deep inside the device, by which it can be destroyed, she knows she has to help the Rebel resistance find and steal the blueprint of the weapon so the Death Star can be blown to smithereens. That alone should be enough to send goose bumps up and down the spine of any true fan. British director Gareth Edwards was only 2 years old when the original film—introducing the world to Luke, Han Solo and Princess Leia, and the loveable droids R2-D2 and C-3P0—came out, but he obviously immersed himself in the culture as he grew. While buzzing and humming with new characters, the visually splendid, dramatically stirring Rogue One remains steadfast to the legacy of the franchise and offers some delightful surprise appearances by “old” familiar faces—good, evil, human and droid. Jyn gradually becomes part of a motley, multicultural, Dirty Dozen/Ocean’s 11-esque crew on a mission to steal the Death Star plans. Diego Luno is Capt. 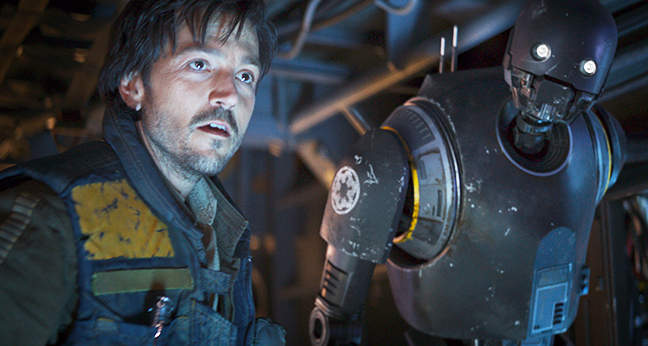 Cassian Andor, a veteran resistance spy, this movie’s version of Han Solo. Forest Whitaker plays Jyn’s mentor, Rebel insurgent Saw Guerra. Hong Kong action star and martial artist Donnie Yen is a blind warrior monk guided by the Force. Riz Ahmed plays Bhodi Rook, a defected Imperial pilot seeking atonement. Alan Tudyk (the voice of the Duke in Frozen) provides the voice of K-2SO, or Kaytoo, a retooled, wisecracking Imperial droid who gets many of the movie’s best lines. Chinese actor-director Wen Jiang is fearless machine gunner Baze Malbus. There are Imperial Destroyers, gigantic AT-ACT Walkers and fleets of Jedi Interceptors and X-Wings in pounding, eye-popping sky and land battles. Much of the action has strong military vibes, such as a rousing speech to the “troops” before a beach landing preceding a blistering assault with guns, grenades and aerial bombing. Filmed in the tropical island atolls of the Indian Ocean, the sequence is like a gritty, futuristic throwback to classic WWII cinema. Off the battlefield, Rogue One works the themes of family, camaraderie and loyalty, and how—throughout time—the heavy hand of rule and repression has masqueraded as “peacekeeping.” When Jedha, a Jedi holy mountaintop city and rebel base, is attacked by the Death Star, it’s no stretch to think of the ancient Roman hammer coming down on Jewish cities like Jerusalem or Masada. “We are stardust, we are golden, we are billion-year-old carbon,” wrote Joni Mitchell in her 1970 song “Woodstock,” her anthem for the hippie generation about how everyone is basically—elementally—connected. Science tells us stardust, originated from explosions billions of years ago, zillions of light-years distant, continues to swirl throughout the cosmos, regenerating in everything in the universe. In Rogue One, “Stardust” is the nickname given to Jyn as a little girl by her father. It takes on a much deeper meaning as the movie progresses, and especially—quite literally—as it ends. Who would have thought that a rollicking space opera so “long ago, in a galaxy far, far away,” back in 1977, could make such an impact, such a cultural explosion, still expanding and spreading? The next Star Wars, Episode VIII, is slated for December of next year, another—starring Alden Ehrenreich as young Han Solo—is tracking for spring 2018, and Episode IX is on the launch pad for May 2019. In space, and just about everywhere else, the Star Wars stardust just keeps spreading, indeed. “We have a long ride ahead of us,” says Capt. Andor as he, Kaytoo and Jyn buckle up when their adventure gets underway. Fans will giddily enjoy every minute of Rogue One’s rousing journey spanning both yesteryear and tomorrow. And when it’s over, they’ll be ready to hop aboard again and again and again, for a ride that may just go on forever.